next April 9, 2015 5:49 p.m.
Photo: Geoff TeehanMatt HodginsJustin Aguilar/Make stuff from it. Don&#x2019;t take assets, make your own version and distribute it as your own. No one likes going to the doctor — you're sick or in pain, and it always takes forever. Now, instead of putting your life on hold, packing up the car, and driving to see a doctor, nurse practitioner, or other health-care specialist, you can pull one up on your mobile phone. 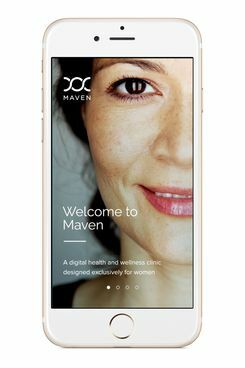 Maven, which means "wise one," is a brand-new app, designed especially for women, that allows access to health care with a few easy taps of a touchscreen. To get started on Maven you download a free app, set up a profile, and select why you're there ("for my own health," "for my pregnancy," or "for my child"). Then you scroll through the company's list of vetted health-care providers. Friendly faces pop up, each with a specialty. You can schedule an appointment for a later time — or for that very second. Whenever your appointment, that same friendly face will appear on your phone screen, ready to help. 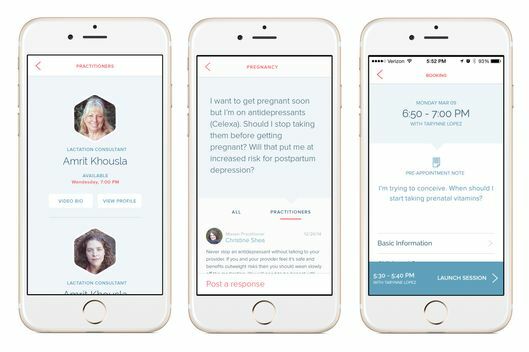 We recently talked to Maven's CEO Katherine Ryder about what inspired her to create a mobile app that aims to end the drudgery of doctor's office visits, what she sees coming in women's health care, and why the 30s are the worst time for women to have babies. What made you interested in women’s health care? When I hit 30, health really started to matter. And then a lot of my friends started having kids, and for a vast majority, there were a lot of questions. I realized that there wasn’t as much support as there could be around that period in life. Right now our health-care system is really inconvenient, and there are gaps in women’s care. So we wanted to take every type of health-care provider a woman would ever touch, from an OB/GYN to a nutritionist, and give her the ability to access them at any time. What makes mobile a good platform for Maven? Mobile video is finally at a point where we could build it into the app easily. People are using mobile phones, and from a regulation perspective the industry is opening up a bit. But we also have a web product in development. What do you see as the limits to mobile health care? There are some areas where mobile makes a lot of sense, and others where it just doesn’t. For example, if you’re breast-feeding and having lactating problems or your baby isn’t gaining weight, a lactation consultant can handle that over the phone. Also, if you have a sinus infection or a UTI, you can get a prescription via Maven. The statistic I keep seeing is that 70 percent of ER visits can be prevented if you just have the right information. But then obviously sometimes a patient will come to Maven and the diagnosis will be to go see someone in person. How do you screen practitioners? We reach out via our own networks or via LinkedIn or Google to get sign-ups. Once someone signs up they go through our vetting process, which includes a written assessment and a case study, and then we do reference checks. We also have a practitioner adviser committee to interview each new person. So if they pass our minimum threshold they get a score, and if the score is at the right level we invite them to practice. Our cheapest appointment with a nurse practitioner is $18 for ten minutes. With a doctor it’s $35 for ten minutes; with a mental-health provider it’s $70 for 45 minutes; and with nutritionists, physical therapists, and lactation consultants it’s $25 for 20 minutes. We’re really trying to make this affordable for people. Right now everything is out of pocket, which is why we tried to make our prices competitive with insurance co-pays. But in the future, if it makes sense, we’re definitely hoping to talk to insurance companies. Are there any other apps like this out there? It’s a newer industry, so there are a few, although we’re the only one for women. So in that sense, yes, we’re the first women’s health app out there. What other innovations would you like to see in women’s health care? I personally have friends and even family members who are really having trouble getting pregnant, so I think fertility is an area that’s attracting great minds right now. Biologically our fertility rate is 12 to 42, but in our society, when a woman is around 30, everyone starts telling her that she’s supposed to have a kid. But you’re finally established in your career and finally coming into your own, so for a lot of women it’s the worst time to have kids. If the fertility window was 22 to 52, that would make things so much easier for women. And there are genuinely people working on changing it. What’s one common misconception about women’s health care? There’s really no such thing as a normal pregnancy. When a woman is pregnant, one of the most frequent questions she asks is, "Is this normal?" With apps like Maven, do you think traditional doctor’s visits will decrease? That’s the hope, because in the American health-care system the costs are so out of whack. So the hope is for all basic things to be treated via telemedicine — in particular in rural areas where there’s a true access problem. When Will Fake Meat Taste Like Real Meat?